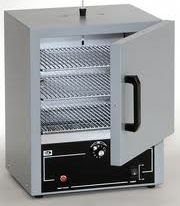 These gravity convection ovens are designed to meet the laboratory needs of industry, research organizations and schools. Well-crafted and versatile, they are used for drying, baking, sterilizing. evaporating, heat treating, annealing and testing. The GC series ovens are competitively priced and offer exceptional value and reliability. Cabinets are as attractive as they are durable. Exteriors are painted light gray and have a hard, scratch-resistant hammer finish. Doors open with high impact thermoplastic handles. Cabinets have heavy steel double-wall construction. Work space is insulated from the outer cabinet with one inch of high density mineral wool, and interiors are made of corrosive-resistant aluminized steel. 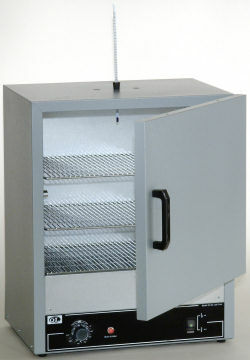 Quincy Lab uses quality UL and CSA recognized components in all ovens. The control panel is equipped with an illuminated ON-OFF rocker switch and a heat/cycle pilot light. Temperature is controlled by an automatic Hydraulic or a bi-metal thermostat. Energy efficient, low-watt density Incoloy® sheathed elements are engineered into a compact design for quick run-up and recovery times. Temperature uniformity is greatly improved by a perforated heat shield which absorbs radiant heat and distributes it more evenly. Models have temperature range to 220ºC (428ºF). *NOTE: All Prices are F.O.B. Quincy Lab, Inc.'s Factory in Chicago, IL. We will work with you on the best way to ship based on cost and date needed.